The third stage of the Hong Kong trail is 6.5 km long and runs from the Peel Rise to the Wan Chai Gap. Skirting around the mid-slopes of Tin Wan Shan, this route consists primarily of level hill paths and passes several streams along the way. It is a hike of medium difficulty. Making a start at Peel Rise, a wide paved road leads uphill for about half an hour. All the while, the sound of rushing water can be heard, hinting at the presence of a flowing stream. 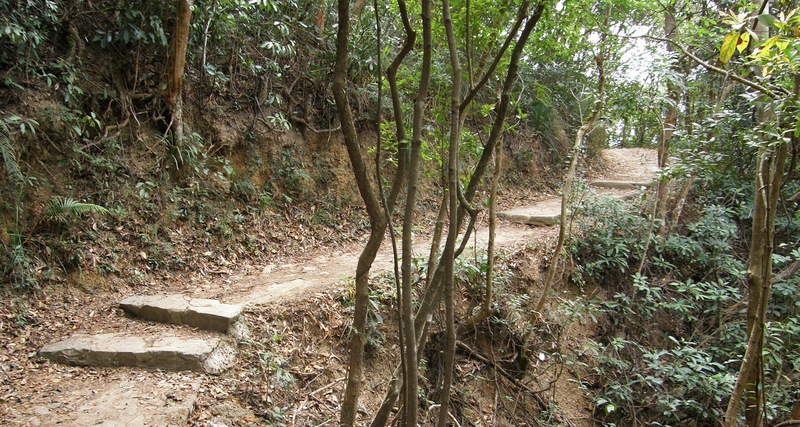 Soon, a small cascade and pool appear on the right: the downstream section of Keung Fa Kan.
Chasing a bend of the hill, the trail crosses a bridge to an open space. The trail traverses a series of streams and bridges, and all along the route, magnificent trees tower over the trailside, embellished by a host of ferns and mosses. A little distance ahead, Aberdeen Lower Reservoir and Aberdeen Upper Reservoir come into view, followed by the sea horse logo and cable cars of Ocean Park in Wong Chuk Hang. These reservoirs were the last two to be built on Hong Kong Island. Beyond the lakes, the trail continues through hill paths and streams, until dividing into two routes – at this point we left the trail and walked upwards to our left to Wan Chai Gap.